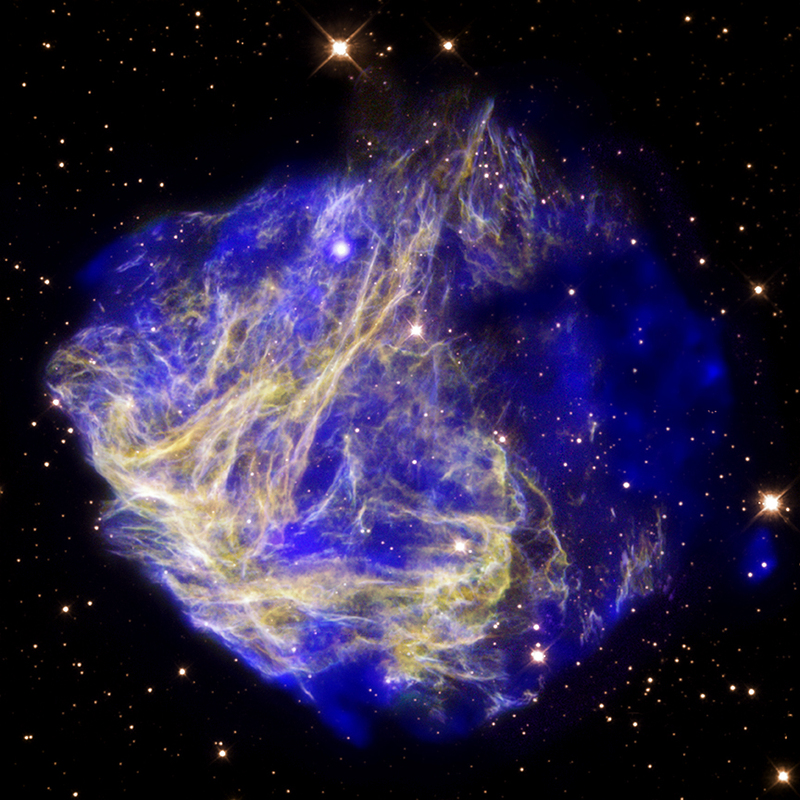 This beautiful composite image shows N49, the aftermath of a supernova explosion in the Large Magellanic Cloud. A new long observation from NASA's Chandra X-ray Observatory, shown in blue, reveals evidence for a bullet-shaped object being blown out of a debris field left over from an exploded star. 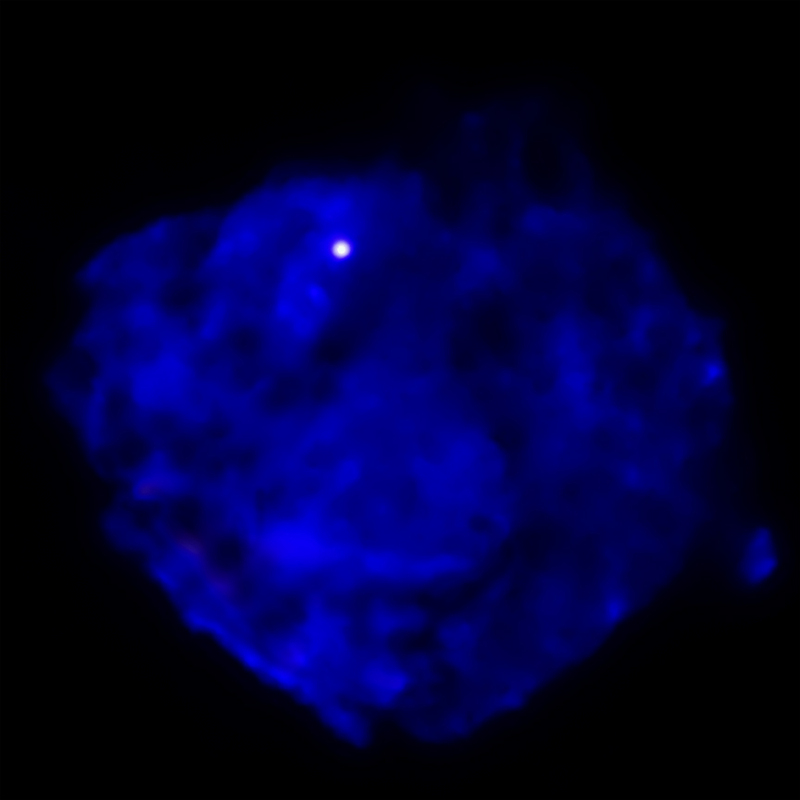 In order to detect this bullet, a team of researchers led by Sangwook Park of Penn State University used Chandra to observe N49 for over 30 hours. This bullet can be seen in the bottom right hand corner of the image (roll your mouse over the image above or click here) and is rich in silicon, sulphur and neon. The detection of this bullet shows that the explosion that destroyed the star was highly asymmetric. The bullet is traveling at a high speed of about 5 million miles an hour away from a bright point source in the upper left part of N49. This bright source may be a so-called soft gamma ray repeater (SGR), a source that emits bursts of gamma rays and X-rays. A leading explanation for these objects is that they are neutron stars with extremely powerful magnetic fields. Since neutron stars are often created in supernova explosions, an association between SGRs and supernova remnants is not unexpected. This case is strengthened by the apparent alignment between the bullet's path and the bright X-ray source. However, the new Chandra data also shows that the bright source is more obscured by gas than expected if it really lies inside the supernova remnant. In other words, it is possible that the bright X-ray source actually lies beyond the remnant and is projected along the line of sight. Another possible bullet is located on the opposite side of the remnant, but it is harder to see in the image because it overlaps with the bright emission - described below - from the shock-cloud interaction. Optical data from the Hubble Space Telescope (yellow and purple) shows bright filaments where the shock wave generated by the supernova is interacting with the densest regions in nearby clouds of cool, molecular gas. Using the new Chandra data, the age of N49 -- as it appears in the image -- is thought to be about 5,000 years and the energy of the explosion is estimated to be about twice that of an average supernova. These preliminary results suggest that the original explosion was caused by the collapse of a massive star. Scale Image is 1.63 arcmin (about 75 light years) across. Coordinates (J2000) RA 05h 25m 25.00s | Dec -65° 59´ 22.00"
I can't help but say it looks like a face within itself. Thanks again for this incredible and amazing article but I'm a little sad, cause with optical light we are not able to figure out how amazing our universe is. That sounds very much like a meteor, and you were very lucky to see one that was so bright. Their color is determined by the chemical composition of the meteor and its interaction with molecules in Earth's atmosphere. hey, Dave, roll your mouse over the image and the labels will appear. Can't find the labeled version of this image, that you suggest we look at on. Thanks the detail is excellent. If a neutron star looks something similar to the above picture through the eyes of Chandra, what would a black hole be expected to look like with Chandra? Similarly RBG colors can be set to represent frequencies of light the human eye cannot detect, rendering beautiful representations of events that we otherwise wouldn't be able to see. The graphic above asks "What do the colors mean", It then answers the question with "x-rays are blue, the optical data are yellow and purple". I want to know this, are the colors shown in the photo a true representation of the colors that are actually present at N49 -or- have the yellow and purple been added by technicians for artistic appeal? I have heard the universe is very black and white in terms of what humans would actually see with our own eyes were we in outer space - yet all these photos from Humble are technicolor-ed. So which is it? Just remarkable. Every time I see Chandra images, I am reminded of my visit to the home of Dr. Chandra Subramanian and his wife who were the most gracious hosts. The aftermath of a supernova explosion in the Large Magellanic Cloud. About 160,000 light years to the Large Magellanic Cloud. X-rays from Chandra were overlaid on optical data from Hubble. About 75 light years across. X-rays are blue, the optical data are yellow and purple. In the constellation Dorado ("golden fish") visible in the Southern Hemisphere.